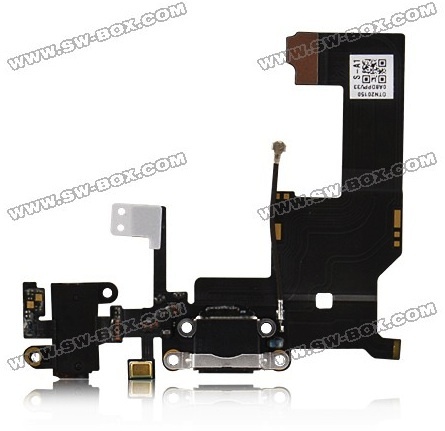 Part leaks from the next-generation iPhone are beginning to ramp up, with component vendor SW-BOX.com having recently added a new headphone jack/earpiece/Wi-Fi cable part claimed to be from the device (via Cydia Blog). The new part joins a claimed micro-SIM tray that surfaced on the site several weeks ago and home buttons that appeared on several sites late last month. If the new part is indeed legitimate, it does represent a significant departure from the component organization in the current iPhone. In the iPhone 4 and 4S, the headphone jack, volume buttons, and mute switch are grouped together on a single component, while this new part associates the headphone jack with the earpiece speaker and Wi-Fi cabling. It is not terribly unusual for Apple to tweak the organization of components, and the new part leak offers essentially no information on any potential changes to the device's form factor, but with part leaks beginning to accelerate it may not be long before more substantial parts begin showing up. Update: The center feature of the part appears to be more reminiscent of the dock connector rather than the earpiece, suggesting that the headphone jack may be moving to the bottom of the next-generation iPhone, as has been the arrangement in the iPod touch. Looks like we're playing an iPhone 5 3D puzzle. Without Steve Jobs the iPhone is doomed. This design looks like a real mess, thanks Tim. If you can make sense of that picture, you could win the grand prize. Looks silly. If the iPhone 5 looks anything like that it's going to flop badly. Is there a iPhone 4/4S one to compare? Ah, very interesting. But please, we need one more rumor about the home button, so I can continue to feel excitement in my life. Whether or not the new iPhone is released in June or October, I'll be getting it as my contract for my iPhone 4 goes up on June 22nd. At least it's nice to see that they combined the earpiece and the headphone jack into one part, as they pretty much serve the same function. The volume buttons, silent switch, and headphone jack part in the 4/4S was pretty much done for location convenience vs function. Also having the WiFi cable attached to this means that it's moved from the back panel, like it is on the 4/4S design. I would like to see what the other side of this looks like as it'll show whether or not the call speaker has moved. This view is from the back as if you were to open it up, this would be what you'd see. how are they even funny?